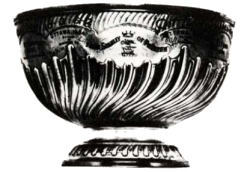 The Stanley Cup, originally a simple silver cup, valued at 10 pounds ($ 48 USD, approximately $ 1.200 today "s) was offered in 1892 by Frederick Arthur Stanley, first Baron Stanley of Preston, 16th Earl of Derby, the last year of his term as Governor General of Canada. It was intended as a trophy awarded annually to the hockey teams in the Dominion. To obtain it, any Canadian team could challenge its owners. The Cup was originally awarded in 1893 to the Montreal Amateur Athletic Association (AAA), champions of the Amateur Hockey Association (AHA), the best hockey league at the time. The first playoff game for the achievement of the Stanley Cup was held March 17th of 1894, and the first decisive game was held on March 22th of that year. This season saw four of the five teams completed the AHA tied for the championship with a record of 5-3-0. 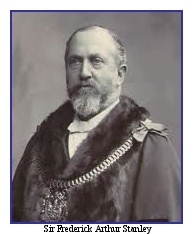 This created a problem for the leaders of the Amateur Hockey Association and the keepers of the Cup in the appointment of a team champion since no formula to separate the teams in a tie was then in place. After long discussions and the withdrawal of the Quebec team of the championship race, it was agreed that a three-team tournament would take place in Montreal with the Ottawa club getting a pass for the final (he was the only club "playing abroad"). The first historic Stanley Cup final was the Montreal Amateur Athletic Association record a 3-1 victory.